The past few months have passed by in a blur as we prepared for an emergency review of our Son's EHCP and a request by his school for him to be transferred to a special school, as they feel that despite best efforts they are unable to meet his needs. Finding the right school to meet all of his needs has been the biggest challenge for us, as identifying the school is down to the parents and you are not given much advice or direction on where to look. Our dream for our Son is to go to University, grow up happy with some good friendships and the knowledge that he could do anything he wanted to do. The right form of education can make a real difference for children and young people on the autism spectrum, whether that's at a specialist school, in a mainstream setting or at home. As a parent, it's important to be aware of the options for schooling which may be available to your child. We want him to be able to get the necessary support that he requires in order to overcome his need to control the world around him, develop his social thinking & social communication skills, and address his difficulty with self-regulating his emotions & behaviours when feeling anxious, frustrated or upset. Our journey began with several websites (see links below), and requests to other parents on various online support forums to try identify potential schools in our borough, and surrounding areas. Next we researched the schools, made lists, made short-lists, phoned schools to find out more and visited those that we thought were a possibility. Despite all this we didn't find a school that we felt was "the one". There are not many specialist schools in our area, and those that exist seem to cater more for children with learning difficulties. Our Son is bright, inquisitive and chatty but requires a great deal of individual support to allow him to access the curriculum, work alongside his peers and manage his emotional outbursts. Where are the schools that would help him in ALL his areas of need? We found it difficult to imagine our Son at the schools we visited, particularly when they spoke of the few children who had achieved A-levels, in Music & Art, a far cry from the dreams we once had have our Son. We were also concerned about moving out of mainstream schooling, and having limited opportunities to interact with other children who were not on the spectrum. In the end we asked that he be considered to stay where he was until we were able to find an alternative that we found was suitable, as we just didn't feel we had any other options to choose from. I was devastated when I heard that he has been allocated to a school for pupils with behavioural, emotional and social difficulties, and is due to transfer there in September when a space opens up. Where was the parental choice that I keep being told about? Choice implies options, and our options have been limited to one school with an Ofsted report that indicates that the "school's expectations of a few more able pupils are not high enough". The decision was made on our behalf, but I still have questions about whether they will they be able to support his academic needs, and whether we are limiting his ability to succeed later on if we take him out of mainstream schooling now. At first I agonised over what to do next. Whilst I have the "choice" to appeal the decision, it didn't feel like we could say no as we hadn't found anywhere else for him to go. Since then I spent a lot of time wondering about why I was so upset about the thought of him moving to a special school, and questioned whether what I wanted is really the best thing for my Son. This involved much soul searching, self-doubt and self-reflection as I questioned each of the things I wanted for my Son - both in terms of his long-term future and his shorter-term immediate needs at school. As I questioned myself, I realised three things. The first realisation was that, based on the information available to me, the best solution to meeting his immediate needs at school felt like it was at odds with our longer-term vision for his future. I don't want to have to make a choice, as I want both. The second realisation is that despite all the research we have done, we can't fully understand the implications of a school move until we have experienced them for ourselves. After all each child is different, and what is right for one child is not necessarily right for another. There was no one out there who can tell us what is the right thing for our Son, they can only comment on what the situation was like for other children previously. The third realisation is that I have an overwhelming fear of agreeing to the wrong thing, and this fear was paralysing me with indecision. This is not a small decision that we are being asked to make - getting the right school will determine our Son's future schooling experience, and can mean the difference between something which is positive vs. negative. I also fear that I am focusing on the wrong things, and so am standing in the way of what would be the right move for him. After weeks of agonising, I was no closer to feeling like I knew what we needed to do. The answer came to me in an episode of Call The Midwife, when a midwife advised a young boy was faced with a difficult decision that "if you wait long enough, things have a way of working themselves out". I just had to commit to A decision. Regardless of which path we decide to take, we will find a way. Right now that means accepting that he can't stay where he is, as he is isolated from his peers and his teachers are finding it difficult to cope. We also have to face the fact that if he stayed in mainstream school his difficulties in interacting with his peers will not allow him to have the type of inclusive interaction that we would hope for. So we need to focus on how best to ensure that he is as successful as possible when he transitions to his new school. 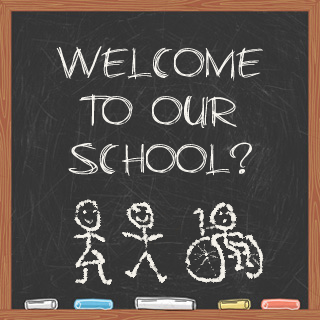 The proposed school seem positive that they can help meet his immediate needs, and we have to believe that they will be able to support his long term needs as well. If not, well then we make that decision when we are faced with it. It might be bumpy and difficult at times but as long as we never stop questioning and keep making the best decisions based on the information and resources available to us, we should keep progressing towards our end goal ..... where my Son is happy and has the option to do whatever he wants to when he is in a position to make that choice.